I was very flattered when I was asked by Jeroen to give some SEO advice in the test stage of his website. I was even happier when I saw how well he had implemented my suggestions. In his concert photography section, he now has links consisting of the event name and the band name and the number of the photo. 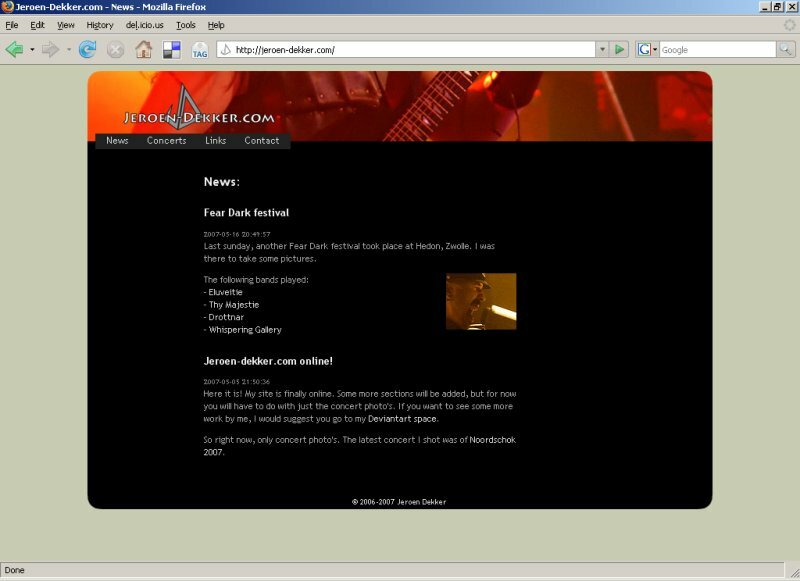 An example URL: http://jeroen-dekker.com/concerts/noordschok-2007/prey-band/1/. Also his page titles follow the same structure. As is often the case with SEO, the best results are acquired by remembering that good URLs are URLs which are cool enough that you won’t want to change the in the future and that good titles are titles which look good anywhere, be it in a bookmark or a search result. Finally, a nice touch that I noticed on his site is that he doesn’t have explicit pagination. By this I mean that clicking on the page 2 link simply takes you to the first photo on that page, so that he needs only an URL for each photo and not an URL for each page or even photoset. Master Rowan, I just changed the bad bad bad list into a good good good list! Is there some other advice you could give your humble follower to make him follow your illuminated standards more? Or maybe even tell me how to improve my website more..
What is that strange noise? Is that the sound of my exploding ego? Today I spoke to a guy who pointed me out these nice links, with which I upgraded my webpage even more into standards! For instance I use doctype now :$ He told me that might get my site higher at the google listings. Indeed, I know these tools. You might want to install the Web Developer extension for Firefox to always have them at your fingertips.